Spinal cord stimulation is a procedure that uses mild electrical impulses to the spine to treat chronic pain due to a variety of conditions, including failed back surgery, neuropathic pain/neuropathy and complex regional pain syndrome/reflex sympathetic dystrophy. 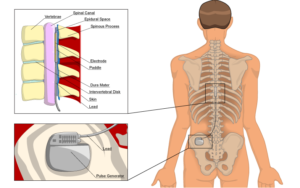 A small pulse generator sends electrical pulses to the spinal cord. These pulses interfere with the nerve impulses that make you feel pain replacing them with a tingling sensation. Implanting the stimulator is typically done using a local anesthetic and a sedative. Your doctor usually will first insert a trial stimulator through the skin to give the treatment a trial run. If the trial is successful, your doctor can implant a more permanent stimulator. The stimulator itself is implanted under the skin of the belly (abdomen), and the small coated wires (leads) are inserted under the skin to the point where they are inserted into the spinal canal. This placement in the abdomen is a more stable, effective location. Using a handheld device that works like a remote control, you can adjust the stimulator to specific areas and levels of pain, depending on your activities and how your pain changes during the day.